Warren Gatland says he has identified a potential second British and Irish Lions attack coach for next summer's New Zealand tour. But Gatland revealed he has not spoken with former England and Fiji sevens coach Ben Ryan, who had been strongly linked to a Lions role. 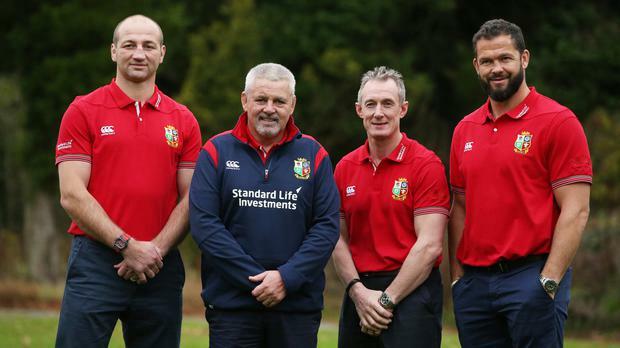 Gatland will be joined in New Zealand by assistant coaches Steve Borthwick, Andy Farrell and Rob Howley, whose appointments were confirmed in Dublin on Wednesday. The head coach had talked previously about taking a second attack coach, with Scotland's Gregor Townsend the strong favourite before he ruled himself out, and Gatland said: "That's the plan. I have identified someone I want to get. "I am definitely looking for someone who is involved in the 15s game." Now that the front-line coaches are in place, speculation will intensify over the make-up of Gatland's final squad, which will be announced on April 19 and comes after an autumn Tests schedule when England won all four of their games, Ireland beat New Zealand and Wales claimed their best set of November results since 2002. "To name a squad now, I would probably get a list of 15-20 names with a good chance of going," Gatland added. "That (autumn internationals) was the best the northern hemisphere teams have done in a long time versus the southern hemisphere. It was massively encouraging. "South Africa, Australia and New Zealand normally come up here and have pretty much unbeaten campaigns, and they go back spouting about how strong the southern hemisphere is. I think we should take a lot of confidence from the performances of the northern hemisphere teams." Ireland's stunning victory over the world champion All Blacks in Chicago was the undoubted autumn highlight, with several Irish players producing outstanding performances. "The guys who really impressed me that day were (scrum-half) Conor Murray and (centre) Robbie Henshaw," Gatland said. "There is a hell of a long way to go. I could mention 10 or 12 names, but by the time the squad's selected in April, someone could have overtaken them. "Conor Murray is an integral part of Ireland. He's probably been one of the most improved players over the last two or three years. "Back in 2013, he would probably have been the starting nine if there was another (Lions) Test. He went out there as a number three, and ended up being number one. "You want good people and good characters. You want people who will fight for their positions. How do you handle disappointment? You always get one or two disgruntled players who feel like they haven't had the opportunity. "I saw that in 2013. There was one player pretty disappointed about not being picked for the first Test, and he threw his toys out of the cot, but regathered himself. There were a couple of players on that tour who had really good Six Nations campaigns, but seemed in Australia like they were just happy to be part of the squad." Gatland, meanwhile, revealed that he has spoken with Wasps fly-half Danny Cipriani, who is currently out of favour with England, adding: "I coached him as a kid. He is not everyone's flavour of the month, but he has some talent and ability, and I wouldn't be doing my job if I didn't discuss him." In terms of the coaches, former England skipper and current Red Rose forwards coach Borthwick is a Lions newcomer, but he has made a considerable impression during England's spectacular unbeaten revival under their Australian head coach Eddie Jones. Former England assistant coach Farrell was appointed as Ireland defence coach earlier this year, and he helped oversee victories over South Africa, New Zealand and Australia, while attack specialist Howley, who is currently Wales boss while Gatland concentrates on Lions business this season, makes his third successive Lions tour as a coach. He also travelled as a player in 1997 and 2001. "I said from the outset it was important to have continuity because we need to hit the ground running, given the limited preparation time," Gatland said. "In Rob and Andy, we have guys who understand the Lions concept, have worked together and know how to coach a winning Lions team. "It's also important to have some new input. Steve has done a great job in shaping the England pack and played a major role in their recent run of success, so I am looking forward to working with him." Independent.ie Newsdesk Man United midfielder Paul Pogba is the surprise inclusion in the 2018/19 PFA Team of the Year, with the Red Devils midfielder the only player selected from outside the top two teams.